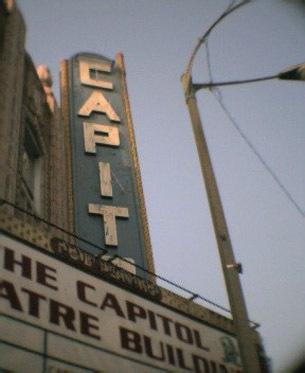 FLINT, MI — Necessary and long-delayed repairs to the Capitol Theatre building have begun with the removal of loose bricks on the east exterior wall of the auditorium to be replaced by new brickwork. The water damage now being repaired is due to runoff of rain water from the auditorium’s roof over time. Other repairs planned include fixing the theater’s vertical sign which is original to the theater but was altered in the 1957 remodeling of the theater. This project was planned for several months and was earlier reported in a March 29 story in Cinema Treasures.